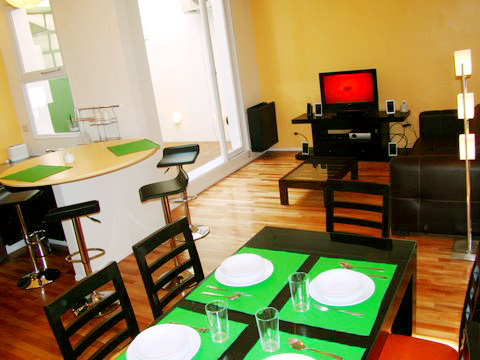 Ample and bright two bedroom apartment located in a ground floor in the heart of Palermo Soho. Very bright and quiet. It has a master bedroom with queen size bed, the second bedroom has a futon bed and a working desk the living room has a elegant black sofa, LCD TV and DVD with Home Theatre. The dinning area has nice table and six chairs. The kitchen is fully equipped with a breakfast bar open to the living. The bathroom is complete with Jacuzzi bath and shower. The apartment has a small patio. Wooden floors. Small Patio. Aircon, TV, cable TV, DVD. Internet High Speed. Maid Service once a week. Fully equipped kitchen with gas range, oven, toaster, refrigerator, microwave. Dishes, kitchen utensils. Old building in very good conditions . Included: Electricity, gas, water, city and building taxes. Telephone for local calls and internet.